A sleek modern design that is functional and visually inviting. Creating a sleek modern design inspired the material choices in this project. High gloss white cabinetry with a touch of aluminum framed frosted glass doors anchored by not one, but two espresso stained islands. A built in coffee station with a beverage fridge and separate prep sink makes entertaining a breeze while a separate desk area adds function yet is incorporated in the overall look. 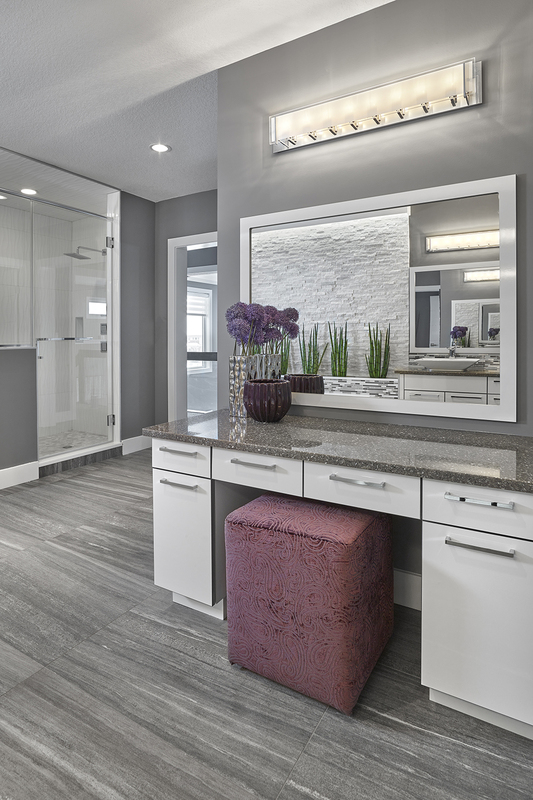 The overall feel of sleek and modern is carried into the master bath which includes floating bathroom cabinets and a custom vanity area. The use of two islands for seating and a secret pantry hidden behind cabinet doors are just a couple design features we love.